"This is what happens when you indulge the idea of negotiating with the unhinged." 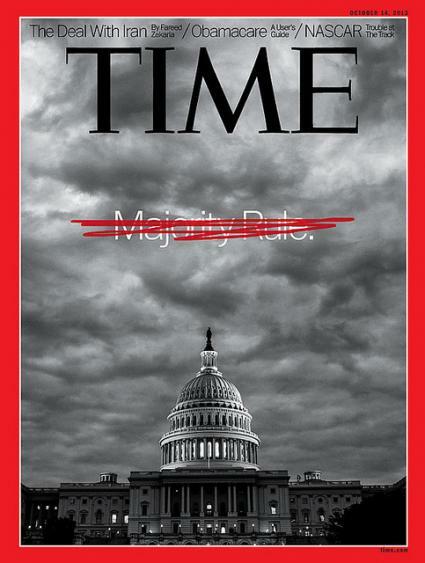 The cover of this month's issue of Time magazine is spot on. The majority is not ruling, and the pundits weigh in on the Teapublican debt ceiling debacle. "This is what happens when you indulge the idea of negotiating with the unhinged. Republicans in Washington first refused to fund the government until President Barack Obama agreed to defund the centerpiece of his legislative legacy, health care reform. Now, having successfully baited the president into at least meeting with them and discussing their blackmail, they’re shifting their hostage-taking to the nation’s credit, saying they won’t vote to pay for what America has borrowed until they get concessions on Social Security and Medicare. The destructive pattern is a threat to stable governance. Actually, let’s be clear about who’s behind the blackmail here. Right now, according to many sources there are enough Republican votes to end this nonsense. But the tea party faction of the GOP has cowed its leadership. House Speaker John Boehner now says there’s no way he’ll offer or support a “clean” bill to raise the debt limit, even though he offered one last spring to Senate Majority Leader Harry Reid. Boehner also says he doesn’t have the votes to get the government back open without some changes to health reform, despite what many others seem to say. So here we are. A week into a shutdown that is yanking billions out of the economy and threatening people’s livelihoods. A week away from the nation defaulting on its debt payments, which could trigger another economic meltdown. In a sense, the GOP is embracing the strategy of the Confederacy: The party is willing to sink the republic to preserve its own ideology. There’s no point to government at all if it’s not going to operate. And if America doesn’t pay its bills, then it’s not an economic superpower — it’s a deadbeat. But the tea party is willing to claim victory behind either one of those outcomes. The president isn’t negotiating, and shouldn’t." "Next time you hear about someone being turned away from a national monument or park or from a federally-funded day care center for low-income children or going hungry because a government feeding program is temporarily shut down, remember this number: 30. Those 30 Republicans, including Iowa’s Steve King, engineered the shutdown only because they didn’t get their way when Congress passed and the president signed into law the Affordable Care Act. So they’re trying to withhold funding from it — and in the process, from everything else. This is not a dispute over a legitimate difference of opinions. This is a case where one group from one party in one house, with no authority to subvert a majority vote or override budget commitments, is refusing to concede that a law is law. Keep that in mind every time you see a news organization’s attempt at balance by allowing commentators on both sides of the political aisle to blame the other. Only one group is to blame here." Cowed by Sen. Ted Cruz (R-Tex.) and bullied by the most conservative members of his caucus, Mr. Boehner has done exactly what he said made no sense. Now he doesn’t know how to get out of the predicament. A shutdown is bad; a default on the debt, which looms 10 days from now, could be catastrophic. The speaker is demanding that President Obama negotiate, while setting “red lines” for those hypothetical talks (“Very simple. We’re not raising taxes.”). It’s not an impressive strategy." "Worried about the looming debt ceiling crisis and possible default of the nation’s debt? Don’t be! According to more than a few GOP lawmakers, conservative donors, and Tea Party activists, the nation’s debt ceiling doesn’t really exist and the chances of a default on the United States’ sovereign debt lie somewhere between unlikely and impossible." "Back in 1979, the Democratic House Speaker, Tip O’Neill, handed the unhappy job of lining up votes for a debt-ceiling raise to Representative Richard Gephardt, then a young Democratic congressman from Missouri. Gephardt hated this, and, realizing he’d probably get stuck with it again, consulted the parliamentarian about whether the two votes could be combined. The parliamentarian said they could. Thereafter, whenever the House passed a budget resolution, the debt ceiling was “deemed” raised. The “Gephardt Rule,” as it became known, lasted until 1995, when the new House Speaker, Newt Gingrich, fresh from the Republican triumph of the 1994 midterms, recognized the same thing that Tea Party Republicans recognize today: The threat of default could be used to extort Democratic concessions. 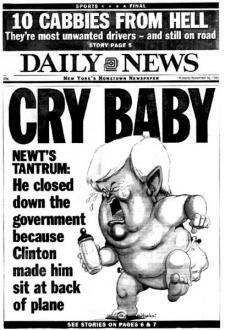 Gingrich abolished the Gephardt Rule, and within the year the government had shut down. The way out of the crisis for Boehner and Obama is to agree on a deal that allows a modest, face-saving concession to Boehner—medical-device tax repeal?—in exchange for reimposing the Gephardt Rule." “Look, I’m in favor of shutting down the government and not raising the debt ceiling, but let’s not kid ourselves. Those are only half measures,” he told Crowley. Yes, Borowitz' witty column is satire, but...in the case of Ted Cruz this doesn't seem that far off, does it?